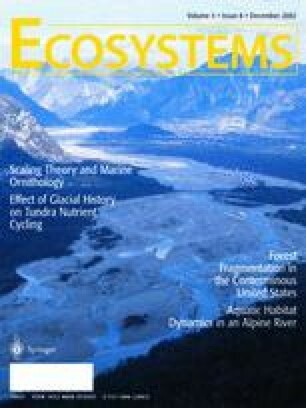 Moist acidic and nonacidic tundra are two of the most common vegetation types of the tundra in the northern foothills of the Brooks Range, Alaska, and they differ considerably in vegetation, soil nutrient availability, and soil pH. Both occur on mesic, gentle slopes, but acidic tundra is more common on older glacial surfaces whereas nonacidic tundra is more common on younger surfaces. Although much prior research has focused on moist acidic tundra, nonacidic tundra is still relatively unstudied. We compared rates of soil carbon (C) and nitrogen (N) cycling and their response to warming and changes in moisture in moist acidic tundra on Itkillik I glacial drift (50,000–120,000 years old, pH = 3–4) and moist nonacidic tundra on Itkillik II glacial drift (11,500–60,000 year old, pH = 6–7). We hypothesized that rates of soil C and N cycling would be faster at the nonacidic site because it has a more favorable pH for microbial activity and higher-quality organic matter inputs arising from its greater herbaceous plant production relative to the acidic site. However, in contrast to our hypothesis, in situ soil respiration, as well as respiration, dissolved organic C production, and net N mineralization in laboratory incubations, was greater for soils from the acidic site. Nevertheless, the sites responded similarly to manipulations of temperature and moisture, exhibiting exponential increases in respiration with warming between 4°C and 15°C but surprisingly little sensitivity to changes in moisture between 300% and 700%. Slower soil organic matter decomposition at the nonacidic site likely results from the stabilization of soil organic matter by high concentrations of calcium. Key words: Alaska; calcium; carbon; decomposition; mineralization; nitrification; nitrogen; pH; respiration; tundra. Received 27 August 2001; accepted 3 April 2002.